What Can You Clean With Karcher K1800? Karcher has been in the cleaning industry since the 1950’s and they produce both residential and commercial cleaning solutions. They started their operations in Germany but have continued to grow and became industry leaders when it comes to pressure washers. They have headquarters in France, the USA, Mexico, the UK and all over the world, really. We have prepared an unbiased Karcher K1800 review since it is a solid choice among their more economic residential cleaning machines. We will perform various tests with the unit and give you our views regarding the pros and cons of the K1800, as well as other useful product information. 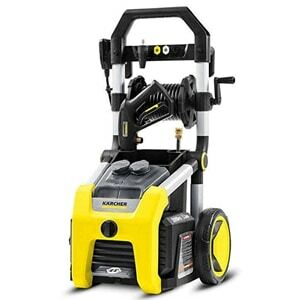 The Karcher K1800 electric pressure washer is a handy cleaning machine with 1800 TruPressure PSI at 1.2 GPM. TruPressure is a technology developed by Karcher for their line of electric pressure washers that deliver 20-30% higher performance than models from the competitors in the same range. The total cleaning power of this unit is 2160. While the number is not as high as other Karcher models, the machine still provides a satisfactory cleaning job on most surfaces. You only need to attach few parts and in 5 minutes you are ready to start cleaning. The K1800 is designed like most other pressure washers – the motor and the pump are mounted on a heavy-duty frame with 2 oversized wheels. But since it weighs around 21.4 pounds, it is considered to be a pretty compact model that is easy to move while you are cleaning around the house. The design for this model has the “high cord wind feature” that lets you mount the cord on the handle to keep it separate from the hose when you are storing it. This model comes with a 20-foot high-pressure hose, along with 3 easy to use nozzles. The Turbo nozzle is good for your in-depth cleaning jobs, the 15° is used for your general-purpose cleaning and the detergent nozzle is used for applying your cleaning products. K1800 also has a removable 0.5-gallon detergent tank. Karcher has also included a power paddle, meaning you turn the unit on or off by pressing your foot on the paddle at the front of the unit saving you from back pain while cleaning. The quiet electric motor on the K1800 has an auto-off feature, meaning that as soon as you stop spraying it stops working, but you still need to tap the off button to be 100% sure it is off. Showing that Karcher did consider storage for their unit, they also included a foldable handle making it a little more compact and easier to pack when you aren’t using it. The Karcher K1800 has a limited warranty of 3 years on most of its parts but a 90-day warranty on its accessories and attachments – which is more than the industry standard. The Karcher company has invested time and effort to develop a reliable customer support service. Unlike other competitors, Karcher offers a ‘Rapid Exchange Program’ which covers the K1800 model. This program allows you to bypass taking your machine to an authorized service center and send it directly to Karcher where their people will fix or replace the unit. You will, of course, have to arrange this via phone or email. This model can handle most of your small to medium cleaning jobs. However, because of the cleaning power, it can struggle with getting rid of old, dried-in oil stains. It does an amazing job cleaning most wooden surfaces like decks, doors or fences, but if you have chipped paint on any of those surfaces you may want to avoid the turbo nozzle. Concrete, bricks, metal, cars, RVs, and tires are easy jobs for the Karcher 1800. Because it is a small residential model, the machine isn’t meant for prolonged cleaning and overuse. It is a light-weight compact cleaning unit which is good for everyday cleaning jobs around your home. You can store all of the parts and attachments on the unit itself. It comes with 3 years warranty and features a food paddle as an on/off switch. As with all Karcher products, this unit comes with custom Karcher parts so it is recommended they should be only replaced with their parts. And if your machine breaks down, you will have to deal with their customer service agents. You can only regulate pressure with the nozzles that come with the unit. It is not the best choice for dealing with oil and rust that has been around for a long period of time. If you need one of the best pressure washers to handle residential cleaning jobs, then the K1800 can be the tool to get rid of grime and dirt around your home or to clean your cars, bikes and so on. Since it is only a small residential model, it is not designed for prolonged use, but for the jobs, we have mentioned, the K1800 will help you get through them quickly. It is sturdy, mobile and offers versatility with it’s 3 easy to use nozzles for all your various cleaning needs. If you are looking for a compact model that’s easy to assemble and store, with enough power for residential tasks, and a good user manual, then the K1800 would be a good fit for you. We hope we have addressed all of the important points in our Karcher K1800 review. If we did not, please feel free to write your questions in our comments section below, and we will respond as soon as possible.